Location: At the university, not taking a graduate course. And, Lo! There Shall Be a Cover! I love that moment when the cover image is finalized and you've had the publisher's blessing to show it to people, because now it means that everything's finished and the book is a truly real. Aiden's Angel will come out some time in May, probably closer to the middle of the month, to coincide with my attending the Romantic Times Booklovers Convention. 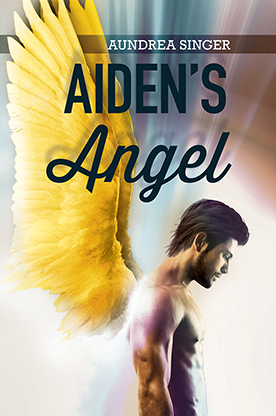 Aiden's Angel is a novella, which makes it shorter than some of my fanfic. Hilariously (or ironically? Alannis?) it's almost exactly half as long as Black Hawk Tattoo. The drawback is that AA won't be available in hardcover, but the pluses are that it'll be less expensive and faster to read. I realize I may have a thing for graduate students. And guys with wings. I admit nothing. I also realize I have no idea how to sum up this post. But I'm happy, how about that?